Tired of searching for wall outlets or swapping out one device to charge another? Tripp Lite's U280-004-OTG charging hub with OTG is the solution, featuring four ports for charging tablets, phones, or other mobile devices, all at the same time. It provides a single location to charge multiple devices, and its sleek, compact design keeps your charging area neat and clutter free. It features two 5 V, 2 A ports and two 5 V, 1 A ports, providing up to 6 A for charging the connected devices. Furthermore, it comes with an internal power supply, eliminating the need to fumble around with bulky power adapters. When not being used for charging, it doubles as a USB OTG hub. Simply connect your OTG compatible tablet or phone to the dedicated port on the hub, and then connect up to four USB devices. You can now use those devices on your tablet or phone. So whether you're at home or in the office, the charging hub with OTG provides an ideal solution for charging your devices or expanding the functionality of your OTG compatible tablet or phone. Standard USB hubs cannot charge your power-hungry tablets, smartphones and eReaders – you’ll need something more powerful like Tripp Lite’s U280-004-OTG. This four-port charging station has enough power to charge two tablets and two smartphones simultaneously. When not used for charging, the U280-004-OTG also works as an On-the-Go (OTG) hub so you can work from your tablet or smartphone while using USB peripherals like a keyboard, hard drive and more. Other premium features include an internal power supply that eliminates the need for a bulky power adapter and over-temperature/over-current detection for extra protection of your valuable electronics. Charge two tablets and two smartphones – all at once! Never again scramble for available wall outlets or extra USB ports to charge your device. The U280-004-OTG features four USB charging ports that deliver a total 6 amps of power—enough to charge all of your power-hungry devices, including smartphones, tablets and MP3 players. It contains two 5V/2A USB charging ports for ultra-fast charging of devices like the iPad®, iPad Mini® and other tablets, plus two 5V/1A USB charging ports for an iPhone®, iPod® or other USB devices that require less charging power. When not being used for charging, the U280-004-OTG serves as a USB OTG Hub. The OTG port on the back of the unit allows an OTG-compatible smartphone or tablet to connect to and use USB devices like flash drives, hard drives, keyboards and mice—all at the same time. 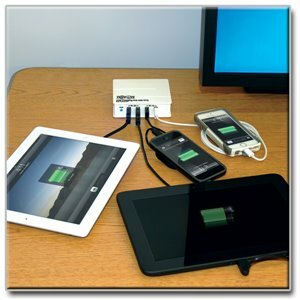 It is perfect for the home, office or anywhere you need centralized charging and OTG capability. The U280-004-OTG comes backed by a two-year warranty. The U280-004-OTG is also manufactured in compliance with strict RoHS specifications, reflecting Tripp Lite’s commitment to environmental responsibility.